"My family does not care for plain strawberry jam, but in combination with oranges, it is gobbled up in no time. Since you are using the zest in this recipe, I only use organic oranges." Inspect 8 half-pint jars for cracks and rings for rust; discard any defective ones. Immerse in simmering water until strawberry jam is ready. Wash new, unused lids and rings in warm soapy water. Wash, hull, and crush strawberries in a bowl. Measure berries; you should have about 5 cups. Scrub oranges well under hot running water and pat dry with paper towels. Zest oranges; place zest in a bowl and set aside. Peel oranges and remove all white pith. Divide oranges into segments and remove any white fibrous membranes and seeds. Chop oranges finely and mix into the bowl with the zest. Place crushed strawberries and orange-zest mixture in a large pot over medium heat. Stir in pectin and slowly bring mixture to a full rolling boil. Add sugar and stir to dissolve. Return to a full rolling boil on high heat and boil for exactly 1 minute, stirring constantly. Skim off any foam with a ladle or a large spoon. 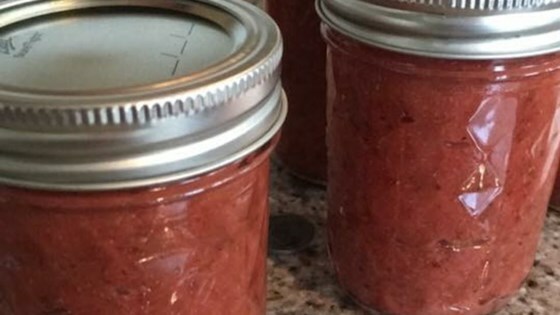 Pack strawberry jam into the prepared jars, filling to within 1/4 inch of the top. Run a clean knife or thin spatula around the insides of the jars to remove any air bubbles. Wipe rims with a moist paper towel to remove any spills. Top with lids and tightly screw on rings.